This two-year-old comparison of nine LEDs to HPS lighting may be technologically dated, but it turned up plenty of real-world issues of application and measurement. The Department of Energy, in cooperation with the Municipal Solid-State Street Lighting Consortium, has released the results of a comparison of nine LED street lights and the high-pressure sodium lights they replaced. The study took place in Kansas City, Mo., over the course of 2011 and 2012. The legacy HPS fixtures consumed 100, 150, 250, and 400 Watts. The results overall: The LEDs collectively demonstrated only slightly higher efficacy than the sodium lights, 15 percent averaged over all nine LED products. Much of the energy saving came from the LEDs' reduced light spillage and overall lower light levels. Some of the LED products met the desired light levels, though some did not. The nine products chosen for the study were selected by Kansas City as the best at meeting its criteria among a larger number of submissions -- although eight out of the nine did not strictly meet all of them. Generally speaking, the LEDs replacing lower-wattage HSP lights met more of the criteria. Note that these products were designed and put on the market three to four years ago, so it is safe to assume that LED efficacy levels would be higher if such a test were to be initiated today. Seasonal changes. Perhaps the biggest surprise coming out of the study was the amount of variability in many of the products' light levels, given seasonality and temperature. Measurements were taken every 1,000 hours of operation (about three months). Temperature and foliage levels had more of an impact on the performance of the lighting than had been anticipated. Field measurement. The study saw unanticipated influences from pole spacing, amount of spill light, street width, and type and amount of vegetation. (Kansas City had been chosen for the study in part because it has well worked-out specifications for street lighting, including such parameters as pole spacing and illuminance levels.) The different types of handheld meters used to measure illuminance were found to vary not only from one to the other, but also with temperature. Product lifetimes. The study recommends a change in the frequent practice of specifying desired light levels and requiring the product to meet these levels at the L70 point, when 30 percent of the initial light level has been lost. This over-specification wastes energy and robs the LEDs of some of their potential efficacy. Because LED lifetimes are so long compared to traditional light sources, a great deal of uncertainty attaches to any attempt to estimate performance levels after 12 or 15 years; the study's authors recommend that the entire exercise should be reframed. The study contains a great deal of detail about field measurements: How they were conducted, expected and unexpected sources of variation in readings, the measurement of luminance vs. illuminance, comparisons between measured and calculated illuminance, etc. The recommendation is that field measurements not be the backbone of assessment, but be used as one part of a comprehensive performance assessment program. Here's a hypothetical: Assume a new study took its first field measurements in February 2014, three years after the DoE's Kansas City effort. 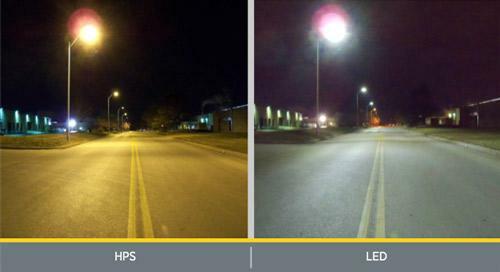 How do you think the results would differ given the advances in LED technology?